When you become the franchise leader in anything, you deserve to get recognized. 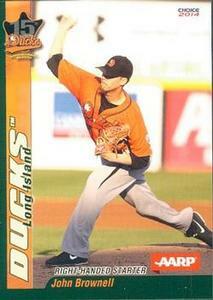 John Brownell, independent league standout and longtime Long Island Duck, has now become their franchise leader in innings pitched at 589.2. The Ducks press release congratulated him after he picked up his third win of the season last Wednesday night. Brownell, now in his fifth season with the Ducks, is approaching two other milestones; franchise leader in wins and starts. He’s ready to surpass current leader, Randy Leek who pitched for the Ducks from 2007-2010 and was the previous leader in innings. While topping the Ducks all-time leader board in 2015, Brownell also had, arguably, the greatest season of his life. Brownell was honored with the Pitcher of the Year award, only the second Ducks recipient in franchise history (Mike Loree, 2011). He ended the year with a 12-6 record and a 3.38 ERA in 26 starts. He was the league leader or tied for the league lead in wins, innings pitched (175.2), complete games, shutouts and strikeouts (146), also a team record. Independent baseball, especially the Atlantic League has made some waves over the past couple years, bucking the trend of traditional baseball. First, they implemented the Pace of Play initiative with the focus on speeding up the game using a variety of rules. And earlier this year, they received a lot of press, especially from ESPN about the new and innovative catchers gear designed to bring a colorful edge to a game deeply entrenched in its history and traditions. Rawlings set up the league’s catchers in new team-branded chest protectors, shin guards and hockey-style masks. Yes, the Atlantic League and all of independent baseball must continue to push the boundaries of what’s acceptable, but Brownell’s accomplishments are a big deal and should be celebrated. For an entire entity of baseball that never gets the credit they deserve for the talent produced on the field or for a product that exceeds expectations year after year, these milestones are set in stone and no one can take that away.